Hales Franciscan High School is the successor to Corpus Christi High School. Opened in 1946, Corpus Christi was a K-12 school located at 46th and South Parkway Avenue (now Martin Luther King, Jr. Drive.) started by the Franciscans of the Sacred Heart Province. The Franciscans are a Catholic religious order founded in the 13th century who follow St. Francis of Assisi. His teachings require followers to dedicate their lives to poverty, chastity, obedience, and the good of their fellow man as well as to commit themselves to social justice and the needs of the poor. Initially Corpus Christi was coed and jointly operated by the Franciscan Priests of the Sacred Heart and the Franciscan Sisters from Dubuque. The school became all male in 1957 when the Sisters left to embark on new missions. Mayor Richard J. Daley and Msgr. William McManus laid the cornerstone at the school on September 8, 1961 and Hales Franciscan opened to young men in 1962. The school’s motto is In Virum Perfectum, which means Unto Perfect Manhood. 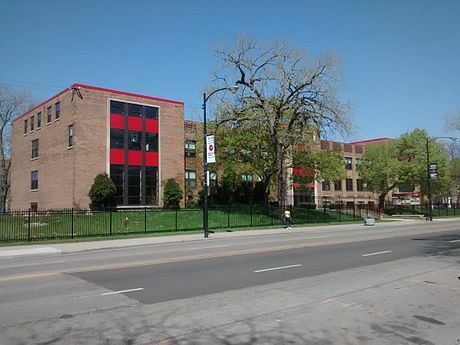 The school’s mascot is the Spartan and its colors are scarlet red, black and white.